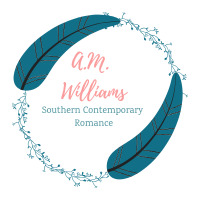 A.M. Williams is just a simple girl from the south that found herself living abroad. When she’s not annoying her cat or reading, she’s spending time with her husband and traveling as much as possible. She has a serious case of wanderlust and wants to go as many places as possible while she can. She loves Cheerwine, sweet tea, and North Carolina (eastern style) BBQ as well as those crystal clear waters on the North Carolina coast. Yep. If you read my books, there are parts of my life and my family/friends scattered throughout. I realized what I needed to work on and got to it. It largely changed my actual writing process and how I write that initial draft. Ultimately, you write for yourself. Even though some people rain on your writing parade, at the end of the day, you're the writer and its personal. Don't stop just because one person said they don't like it.